Does Ina ever make anything that's not absolutely delicious? To Read More, Click On The Recipe Title. I haven't made every single recipe she's posted but I can tell you that this recipe is just that, delicious. I love the crumb on this cake, it's thick and a little crunchy which goes so well with this moist coffee cake. I will make this with a little more lemon zest then the recipe called for because I love the combination of blueberries and lemon, sooooo refreshing! I didn't have extra large eggs on hand so I used 3 large eggs and it worked beautifully. 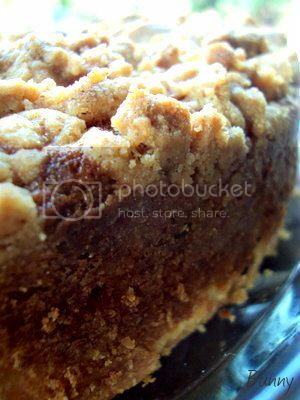 The cake is super moist and light, no dry coffee cake here! 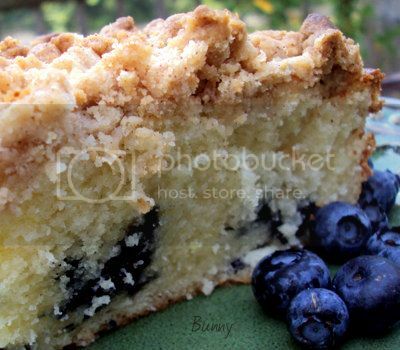 You could take this cake and add raspberries instead of blueberries, or use chocolate chips instead of berries. Add some nuts to the crumb topping or inside the cake. This is the perfect cake to experiment with and make your very own. ENJOY! crumble the topping evenly over the batter. Bake for 40 to 50 minutes, until a cake tester comes out clean. Cool completely and serve sprinkled with confectioners' sugar. I love Ina too. Have all her cookbooks. She had never let me down. Looks delicious Bunny! What a delicious looking cake! I love Ina's recipes. I make fun of Ina a lot for her whole uppity Hampton lifestyle, but I will admit she makes some delicious and acesssiblle recipes. This looks delicious. You certainly do it justice. the cake looks soft and there's plenty of crumb topping--i'd call this a success! 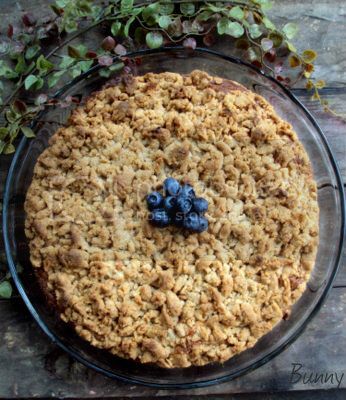 It's blueberry season now so definitely will give this delicious looking cake a try.